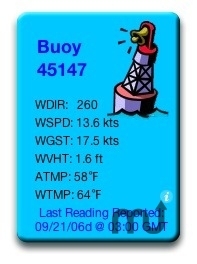 Widget displays weather info from NOAA buoys. Is there a better alternative to Windbuoy? Is Windbuoy really the best app in Strategy and War category? Will Windbuoy work good on macOS 10.13.4? Windbuoy is a simple customizable widget that retrieves and displays wind speed, direction, and gust as well as air temp as reported by any one of hundreds of NOAA buoys. Speeds can be reported as m/s, knots or mph; temp as celsius or fahrenheit. Windbuoy needs a rating. Be the first to rate this app and get the discussion started!